Will this model hdbaset transmit 4k over a single cat5e? BEST ANSWER: No, CAT5e doesn’t support the speed needed for 4K transmission. Yes, it will according to their specs. BEST ANSWER: You can use it for controlling the projector or display from the source end. Premium TVs and Projectors have a 2-way serial control port for remote control. A system like Control4, Savant, Crestron, RTI can use this as the control instead of IR or IP Network control and do so very reliably. The RS232 connection can be used to control a projector. I tested it out and was able to send serial commands to an Optoma projector. This provides a more reliable control method than IR remotes. The extenders are working great! RS232 is a 60+ year old protocol (a standard) for data communication over a serial connection. In this case its used to communicate status of the TV back to a controller and remote commands for the TV from the controller. I believe it's a serial computer interface control. That's what it does with my video equipment. I have not used that feature on this box. RS232 is for use with home automation or control systems. How many ethernet ports does this unit have? The pictures show only ONE per unit (Tx & Rx), but the diagram in the description shows THREE per unit (Tx & Rx), demonstrating simultaneous connections between each unit, as well as a Router, PC, Laptop, etc. BEST ANSWER: Hi Tulio, We used a stock HDbaseT diagram shared with PID 21608 for the product description and will be updating it to prevent any additional confusion. PID 21608 is PID 21609 sister SKU that features the ethernet support as well as some additional extended range benefits. HDBaseT products can support 100BaseT Ethernet support on specified ports only. Thanks for bringing this up and sorry for the confusion. The pictures are correct and we are working on fixing the diagram. The diagram is for a different model - Product # 21608. It has only 1 ethernet port on each unit. Will this model transmit 4k@60hz over 60ft on a single cat5e?" BEST ANSWER: I'm sorry I don't know. It's end up that I needed to return this item because I was trying to transmit over 150' on a CAT 5 and I had to convert to fiber optic. Monoprice was wonderful with the return and with helping me get what I needed. Yes and no. Yes it does 4k@60hz, but look at the chroma scaling. It’s 4:2:0, rather than the desired 4:4:4. If you’re looking for pure 4K, this isn’t the Extender for you. If you’re okay with chroma scaling, it’s a great solution. You want at least cat6 SFTP for this, it's way more sensible than Ethernet signal even though the media/cable is the same. Does it have HDMI CEC or ARC support? BEST ANSWER: If you are looking for HDBase T with ARC support, please check out part number 21668. It does support CEC pass thru but does not support ARC. Thanks! Anything coming out with HDBaseT 2.0? BEST ANSWER: Yes! Thanks for asking. Please check out part numbers 21668 and 21669. And more coming later in 2017! Also please check our part number 21792, which has full HDR support up to 100m. Yes, please check out 21608, 21668 and 21669. More coming soon! HD BaseT 2.0 matrix switcher? Perhaps a silly question, but would a Cat 5e cable work in any form or fashion, even at a short distance? or is Cat6 the only option? BEST ANSWER: Hi Thomas, Cat5e will work in some instances, but we highly recommend the use of Cat6 to gain the maximum available performance. Cat6 supports 10-gigabit speeds while cat5e is only capable of gigabit speeds, the discrepancy in cable performance alone is 10x, which can affect the overall performance of the HDbaseT transmission. Cat5e may work in certain special applications, as long as there is an understanding that top level performance may suffer. Thank you for reaching out to us. I have this working on about 50ft of solid core CAT5e terminated to punch-down blocks (also CAT5e rated, from monoprice), and some home-made ~1' CAT5e stranded cables finishing the connections. What IR controllers/sensors are compatible? 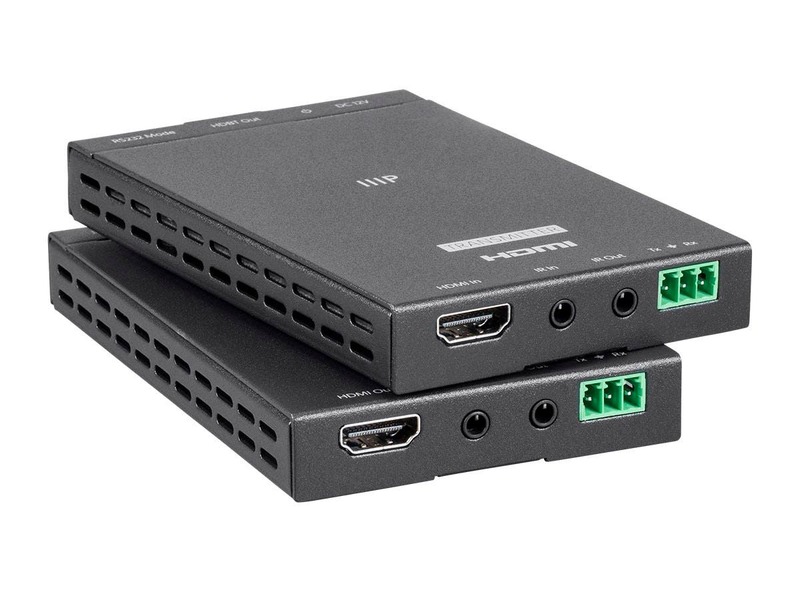 Is there a product that would allow 2 more HDMI outputs in a similar fashion? BEST ANSWER: Any ir sensor is compatible as long as it has a 3.5 mm jack to input and output from the units. 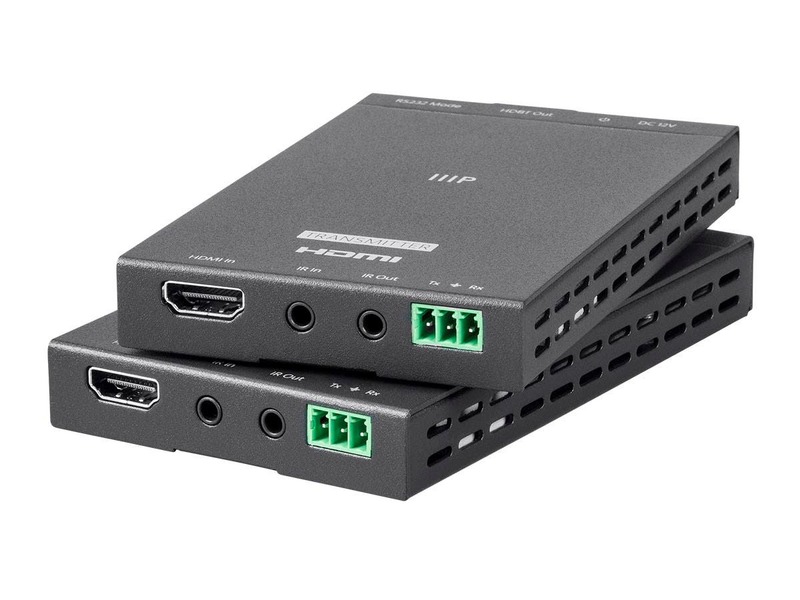 There is another product with 3 hdmi ports that provides switching. Honestly, make sure you have a solid Cat6 cable run because these did not work on a Cat5e run for me. Unless the device I just received has defective IR ports, 3 different sets of IR emitter/receiver pairs did not work! I've tried several ir receiver and transmitter cords and none have worked so far, including other Monoprice branded stereo IR receiver and transmitter cords. What is an example of a specific brand of cord that will actually work with this product? I tried 3 different IR transmitters/receivers, including the Monoprice ones, and none have worked. Has anyone successfully used an IR solution with this hardware??? 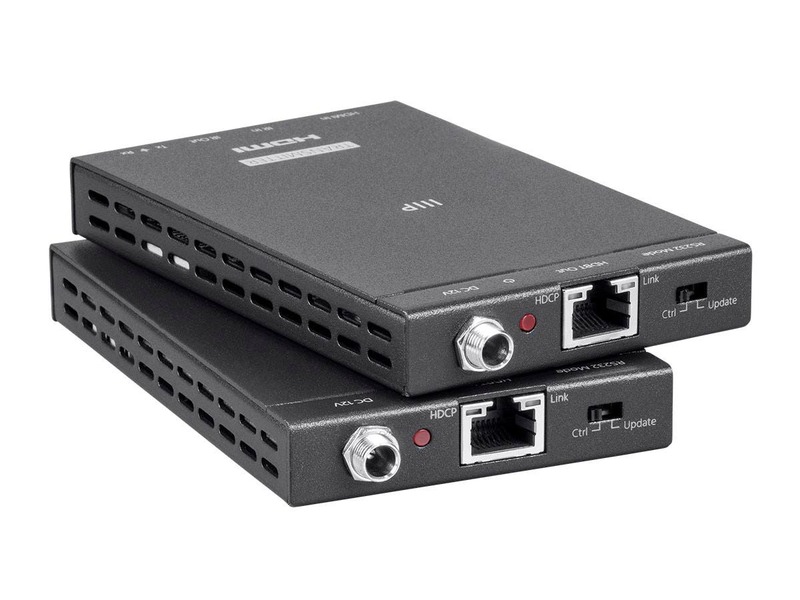 Does Blackbird 4K Pro HDBaseT Extender Kit work through a network router? And bonus question, does it work over a powerline network adapter? BEST ANSWER: HDBaseT will not work through a router or switch. Both a router and a switch require IP based packets. While HDBaseT does packetize, it uses T-packets which is a completely different protocol. For this reason I don't believe they will work over powerline. 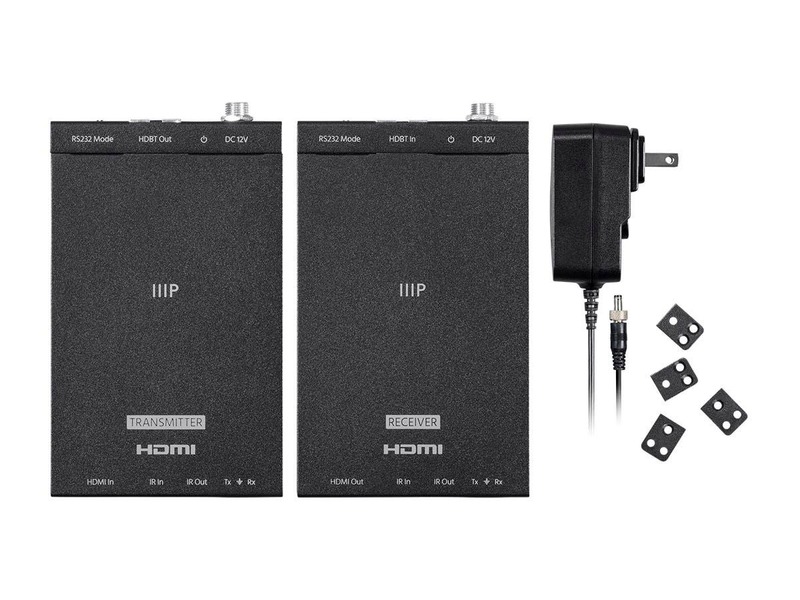 There are HDBaseT devices made specifically for powerline (imagine this device with an integrated powerline setup), but Monoprice doesn't carry them (at least not currently) and they are pretty expensive. 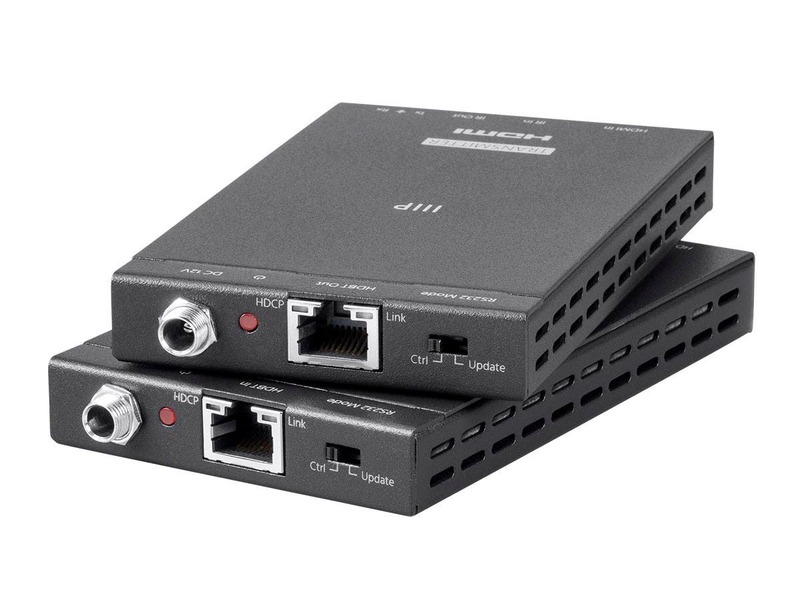 Monoprice does have a device that would work through routers and powerline adapters because they do use proper IP packets, those are the Bit-Path AV products. HDBaseT requires a dedicated Cat5e or Cat6 to route video. It does not work over a network switch. New technology is working towards distributing video over networks, but it's very expensive and not quite ready for primetime. So if you have a spare Category cable you can use this extender to pass 4K video. You CANNOT do both video and Data with this unit - there are some that will do video and network on the same device but those are more expensive and it's more that the video device ALSO passes network than the entire thing working over the network switch. No. It must be connected device straight to device. No network adapters at all. Does this unit work with an HDMI splitter? Does this work with a cat5e cable? BEST ANSWER: It has worked fine for me. I have been running this extender over approximately 60 feet of Cat5e cable 24 hours a day 7 days a week for the last nine months without any problems. I use the extender to run 4K video from a multi-camera NVR security system to a remote 4K monitor. The unit does run a little warm but it has worked great Cat6 cable does have less signal loss and more noise immunity than Cat5e cable so it would probably allow a longer cable run but I have not done any formal testing to verify. It technically could over short distances. However, you may experience artifacting or other quality issues. If you have cat5 cables already run, I would advise using a 1080p extender instead. What is the latency? Is there noticable delay in the audio if the two moniotrs are within earshot of each other? BEST ANSWER: I tested these with a parallel HD-SDI singnal and extender into my switchers and saw no latency whatsoever. Since this unit is HDBaseT, there is no latency introduced. Can I use Cat-6 Ethernet cable to send 4K video @ 60Hz to a distance of 50ft (15-16 meters)? Or only Cat-7 cable is reliable with 4K @ 60Hz? BEST ANSWER: Hi Khurram, the PID 21609 performance features are designed to operate with Cat6 Ethernet cables. while Cat7 cables offer an improvement in performance over Cat6, we have designed this unit to operate with a cable type that is much more common. That said, PID 21609 is capable of supporting 4K@60hz 4:2:0 at 35m with used with an Ethernet Cat6 cable. Where can I see the user manual for this? BEST ANSWER: Hello, at the moment we do not have the manual available on our website. Feel free to email our technical support team at tech@monoprice.com for further assistance in regards to obtaining the documentation, thank you! The manual isn't that useful. what are you looking for an I'll try to answer. Does this extender support HDR? BEST ANSWER: Thank you for your question. This unit will not support HDR. This actually does work for HDR at 24p, 25p, and 30p. Any frame-rate higher exceeds to 10.2Gbps limit and requires the 18Gbps model. For HDR support you can use our part number 21792. The specs say HDCP 2.2 and HDMI 1.4, but the 4k60 says you need hdmi 2.0 to support based on the HDMI version comparisons. Will this device support UHD bluray and devices like the Roku Premier which have hdmi 2.0 and hdcp 2.2 with 4K content? BEST ANSWER: I have verified that this works at both 2160p24 and 2160p30 with both HDR10 and Dolby Vision (YUV 422). Anything greater exceeds the 10.2Gbps limit of this model. There is another model (HDR in the title) that supports 18Gbps. I use this with Roku Premier+ and a UHD Samsung TV and it passes the Roku's tests for HDCP 2.2 and HDR. One reviewer said, "...Receiver unit gets quite hot, however.". Does anyone know if the Receiver is hot all the time (because it has constant power) or is it only hot when being used (when signal is passing through)? BEST ANSWER: I would NOT say it gets "quite hot". While the temperature aspect is subjective to touch, my experience so far has been that it definitely gets warm but not "hot". More of typical electronic warm even after multiple hours of being on and transmitting. They both get hot, but NOT really hot, but toasty,. Mahalo Scott, but are they always hot or do they only get hot when in use (while watching TV)? Ok, good to know, mahalo! I am going to be mounting 5 of these in an enclosed cabinet, but will ventilate the cabinet with (2) 120mm fans (One fan pulling air in at the bottom and one fan pushing air out the top.). With how hot they can get, do you think this fan installation would be adequate? Is this going to work using Ethernet over Power 1Gb Powerline Adapter? It uses power over Ethernet technology. Just out the power adapter on the sending side and it will power the receiving side. Are the IR accessories included in this kit? BEST ANSWER: No, you must purchase separate IR emitter and no CAT cables come with it. No, this kit does not include any IR accessories or HDMI/CAT cables. Which IR receivers/extenders are compatible with this device? Tired of asking this same question. BEST ANSWER: Just to add to this for someone's future use. My remote system utilizes a Global Cach iTach IP/IR converter. I was able to connect the iTach unit directly to the IR "in" on the Blackbird unit using a 3.5 mm mini patch cable. Make sure to use IR port 3 on the iTach unit (that port has a higher output that the Blackbird needs for the direct IR transmission). Connected an emitter to IR "out" of the Blackbird on the TV side and worked perfectly. i spoke with tech support about the same issue, and they had mentioned in about a week there will be a compatible IR receiver available from monoprice. I bought an ultra 4K 75-inch TV but I'm not getting the ultra 4K picture quality will this transmit 4K quality to my 4K TV? BEST ANSWER: Based on the specs and my personal experience, you should get 4k with the device and 4k programming. I'm no expert but two factors that may play into your situation would be a) what ethernet cable are you using? I elected to use Cat 6e and, b) how long is the cable run to your TV? My understanding is the better the Cat x of the ethernet cable, the longer you can run it up to certain limits. Also, you may check to make sure your HDMI cables are in good shape. Finally, make sure your 4k programming source has the correct settings selected. Good luck. Yes, up to 35 meters on CAT6 cable. Otherwise maybe. This item would have a 30 day refund and one year replacement warranty like the other extender kits we manufacture. The product photos show and the diagram are different - the photos show 1 ethernet port on the receiver and transmitter and the diagram shows 3 ethernet ports - which one is it? For my application, I am showing live camera video on TVs across the room, but the audio is coming thru a sound system with zero delay. Will this system provide video transmission 100ft away and still sync up with the audio? BEST ANSWER: Thank you for your question. Yes, the audio would sync up. However, it would be recommended to use a shielded ethernet cable to help prevent any interference. If running the ethernet cable through the walls, be sure to keep the ethernet cable as far away as possible from the power wires in the walls. Will this work with other resolutions as well such as 1080i and 720p? BEST ANSWER: Thank you for your question. Yes, this unit would support other resolutions such as 1080i and 720p. Main difference would be the age of the technology used in both items. They would both support IR, PoC, HDMI 1.4, etc. The 15777 has older tech however, which was more expensive at the time, making it a more expensive kit. Does the Poc allow powering a device such as a camera at the remote end as the HDBT specs indicate? BEST ANSWER: No, this is not PoE. BEST ANSWER: Thank you for your question. This unit will have a 1 year warranty. Does Blackbird 4K Pro HDBaseT Extender Kit support 5.1 surround sound? BEST ANSWER: Thank you for your question. Yes, this Blackbird 4K Pro HDBaseT Extender Kit will support 5.1 surround sound just fine. BEST ANSWER: There should be no issue using a Roku, Amazon fire, AppleTV, etc. with this unit. It will support up to HDCP 2.2 and supports the supplied resolutions of those devices. As for the IR repeater, I do not see why the 18533's IR transmitter/receiver would not work. Recently purchased a Epson 5040ub 4K to replace a broken 5020ube 1080P projector. The 4K created a cable length issue so I needed an extender. This Blackbird HDBaseT solved the issue. I now have my audio/video components in another room and can play all 4K material with no issues. This was an easy hookup basically plug n play. Couldn't get it to work on anything longer than a 20' cable. Would have liked to have sent it back, but paid express shipping and was able to barely get it to reach. I bought this unit because I needed to send video from my iMac to a projector mounted very high in the rafters in a gym. It is for a church. It works great! I've only been using it now for a couple months, but so far so good. tl;dr: if you want to use an IR blaster with this unit, buy product #27220. We bought the 12V IR blasters from Monoprice (Product #27220) so that we could control the projector using the remote while sitting in front of the computer, nearly 100 feet away. It works great, but BEWARE! There are two IR blasters you can purchase from Monoprice, and their labeling is TERRIBLE. The *other* IR blaster, product #32993, is 5V, and it is NOT compatible with this unit. But it *is* compatible with other blackbird HDBaseT extenders from Monoprice, while *this* one, the 12V is not. As far as I can tell, there is no indication on the Blackbird units themselves as to which IR blaster will actually work. It's very irritating, and I wasted over an hour with their support talking to someone who had no idea about all of this. Based upon the reviews, I expected these to lock the signal with no problem using a new 75' Cat6 cable. However, they don't very well. I'm using them to run to my ceiling mounted home theater projector. I replaced a pair of 30 buck, off brand eBay HDMI extenders with these because these have the availability to send IR in either direction, those don't. However, those actually lock the signal quite a bit better than these do when swapped in/out of my wiring. Strangely, if I put the power adapter in the receiver, the signal locks better than if I put the power adapter in the transmitter. Not sure why that would make a difference, but for some reason it does. Maybe it's just my units. Installed using 6A cable. Works out of the box. Zero issues. Works perfectly. Only thing, web site diagram shows IR transmitter/receivers to be used with the devices but no clue is given where to get them. I purchased this unit to connect a newly installed patio tv to my equipment cabinet at the opposite end of the house. This thing powered right up and sends very sharp and clear full HD over a distance of around 100 ft. over the CAT6. Thanks Monoprice. I had a HMDI cable that was about 75 ft long go bad (5 years after installing it) to a TV located in a remote location. Running a new HDMI cable, while possible, would have been labor intensive, very difficult and expensive (redoing sheetrock, etc). Fortunately, I also had in place a Cat 6 network cable to the same location between the TV and the media equipment closet that I used for IP control of the TV and the smart TV functions of the TV. I was able to use the Blackbird extender and the existing Cat 6 network cable to serve in place of the bad HDMI cable. It seems to be working flawlessly. On the media equipment closet side of things I have the Black connected to a 4 x 1 Monoprice HDMI switch. By using the network cable for the video transmission I was no longer able to do IP control of the TV (wish I ran two network cables when doing the original install). The Blackbird has a function for IR control/transmission. I was able to change my iRule remote for the TV functions from IP to IR control. I then connected the IR out of my Global Cache iTach IP/IR converter directly to the IR "in" on the Blackbird unit using a 3.5 mm mini patch cable. If doing this, use IR port 3 on the iTach unit (that port has a higher output that the Blackbird needs for the direct IR transmission). Connected an emitter to IR "out" of the Blackbird on the TV side and worked perfectly.